With their adorable faces and their shaggy hair, teddy bear hamsters are the rock stars of the rodent world. 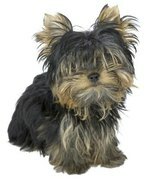 Their pictures adorn greeting cards, posters, coffee mugs and T-shirts -- yet their presence in pet shops has diminished. Though they're delightful pets, they're exceptionally susceptible to wet tail, a potentially fatal disease. This teddy bear hamster found a hair in his food. There goes your tip. Teddy bear hamsters aren't a breed unto themselves; they're long-hair variants of Syrian or golden hamsters. A recessive gene causes some Syrian hamsters to have long hair. Just like the short-hair Syrians, long-hair or teddy bear hamsters come in a variety of fur colors including tan, cream, white, dark brown and black, and combinations of two or more of those colors. Because genes are involved, long hair in Syrian hamsters isn't necessarily a lottery game that bestows flowing locks on some and short hair on others. If two long-haired hamsters mate, all of the babies will be long-haired. According to the hamster breeder website Hammy's World, breeding a long-haired hamster with a short-haired one will produce a mixed litter with both varieties. If your teddy bear hamster's hair seems especially out of control, long enough to stick out wildly every which way, it's likely you have a boy. According to the Encyclopedia of Life, male teddy bear hamsters typically have visibly longer fur than females do. The difference in fur length for males and females is especially noticeable in the flare of fur along their sides and hindquarters, sometimes called a skirt. Wet tail is an intestinal disease that any breed of hamster can get, but teddy bear hamsters are more vulnerable to it. It's called wet tail because of one of its most obvious symptoms: a wet, soiled area around the hamster's tail, caused by the watery diarrhea that is another symptom of the disease. According to the Veterinary Partner website, other indications of wet tail include loss of appetite, irritability, discontinued grooming and hunched posture. The mortality rate is high, so it's vital to get your hamster to the vet for treatment if you see evidence of wet tail.